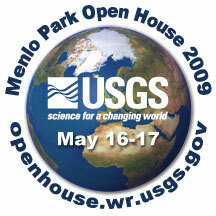 Every 3 years, the USGS Western Region throws a party and invites the entire community: time again for the 9th triennial Open House in Menlo Park May 16 and 17, from 10am to 4pm! If you have an interest in earthquakes, volcanoes, geology, energy resources or the natural history of the Bay Area and Pacific Northwest, this is the event for you. The price is right too: FREE! This will be a rare opportunity to ask that question about geology that’s been bugging you ever since you saw that History Channel show. Attend a presentation on the latest earthquake or tsunami research from an actual USGS scientist. Get an up-close look at the tools and techniques the USGS uses to do research, modeling and simulation, and even produces the famous maps. There will be a number of kid-friendly activities including earthquake safety, hands-on geology, and gold panning, as well as guest exhibits from the Coyote Point Museum, California Academy of Sciences, and the Tech Museum of San Jose. These events are well-attended so get there early as parking will be limited. Alternatively, the Menlo Park Caltrain station is a few short blocks from the campus. For directions to the campus, the USGS has set up an Open House website and a Facebook page.